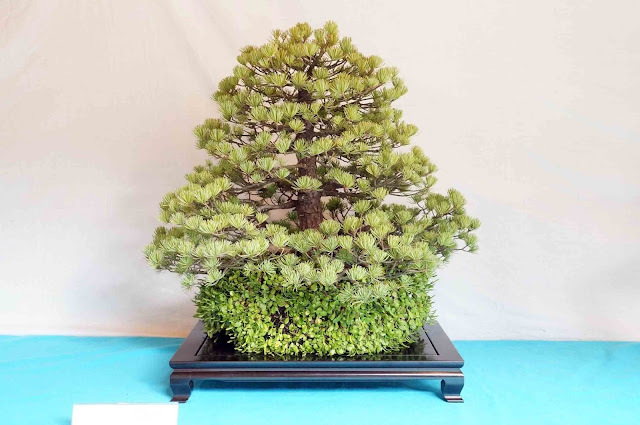 For Your Small Japanese Garden by YUKIMONO: 5 trees that were very impressive at the bonsai exhibition "Ogikubo Hachiman 2015"
5 trees that were very impressive at the bonsai exhibition "Ogikubo Hachiman 2015"
As I informed before, the bonsai exhibition at the shrine “Ogikubo Hachiman” 2015, was held on September 12 and 13. 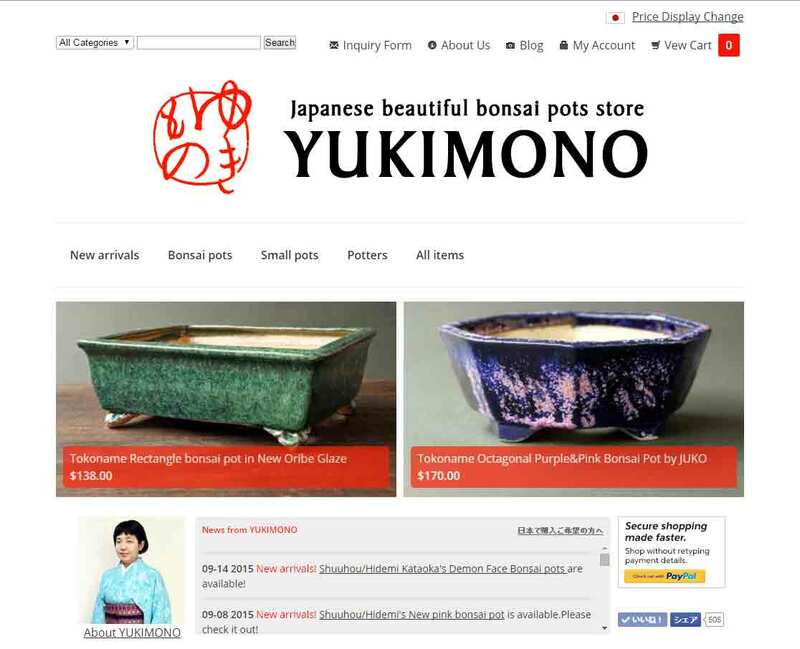 I went to the place the day before the opening day, and helped to prepare for the exhibition as one of exhibitors and an operating supporter. The day after the last day, I joined as a member of a team the putting bonsai in order. For these four days, it was really splendid and I have had a lot of fun with some great bonsai artists, local celebrities and my friends. Though all bonsai displayed at this exhibition were beautiful, I will introduce some of my favorites. 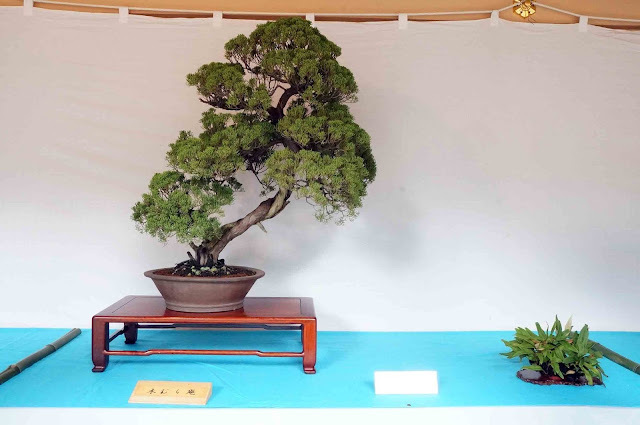 The first is a large Shimpaku done by the bonsai artist, Shinichi Nakajima. I think it has a beautiful form with the characteristic of dignity and grace. It is not a showy work, but I never get tired of looking at this tree. The third is a Sabia japonica with beautiful blue fruits. 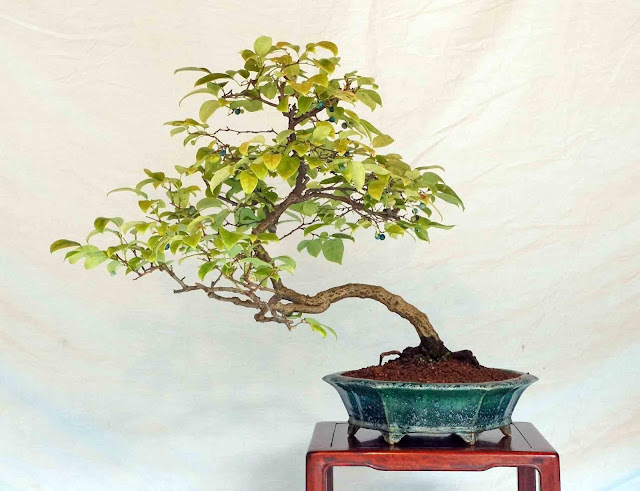 What a fabulous combination with the tree and the blue glazed Tokoname bonsai pot! 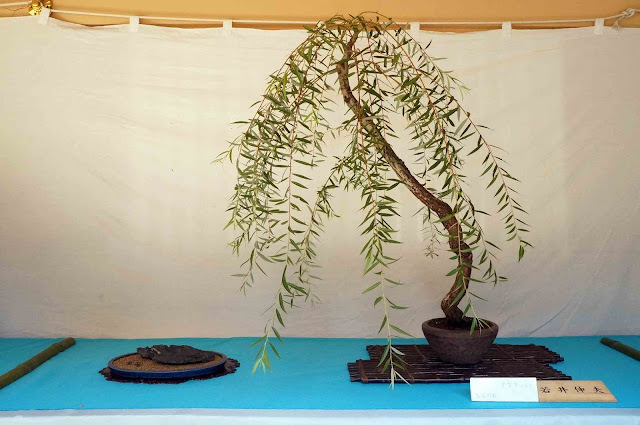 It was the bonsai that Nakajima-san did for me as a work for display. The fourth is a very lovely willow tree done by the bonsai artist, Toshio Ogawa. This work easily makes us imagine the view of natural willow trees on the riverside. ・the small oak with pretty acorns. 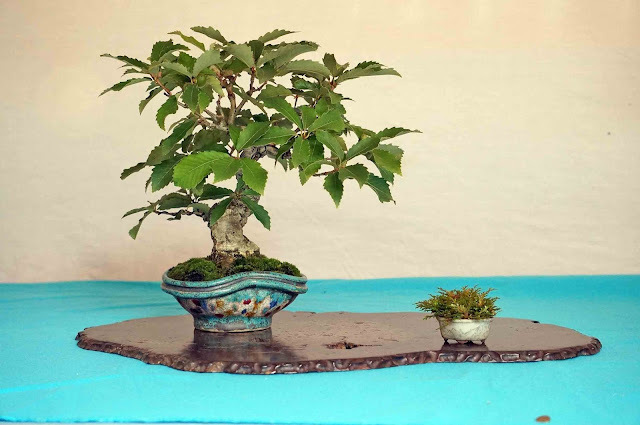 The last is a small Japanese oak directed by the bonsai artist, Takeharu Nakagawa. The pot planted the tree has some colors (blue, red and green) and very unique shape. I think it is very difficult to match such a pot with a tree, however, the pot goes very well with the small oak with pretty acorns. 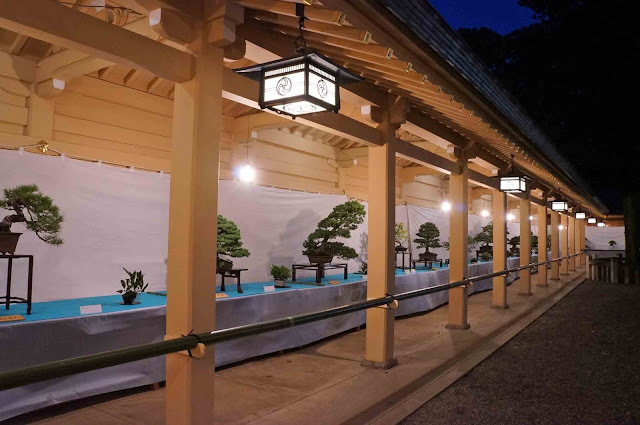 The bonsai exhibition at the shrine “Ogikubo Hachiman”2016 will be held on September 11 and 12, 2016. See you again!